It is no secret that Brussels is renowned for its Art Nouveau buildings. If you are a fan of this end of 19th century’s architectural style, there’s of course the MIM, but I suggest an afternoon walk in one of Ixelles’ specific district, the Bailli/Châtelain block. One of the most interesting thing I visited in Brussels was Maison Horta, the house of the famous architect Victor Horta, who greatly contributed to Brussels’ architectural scene. Start your afternoon at the Maison, which is worth visiting. It’s absolutely beautiful, and even if you think it’s “touristic” – which, agreed, it is – it’s an interesting hour-or-so visit that will fill your eyes with gorgeousness and take you back to Brussels’ glamorous days. I’m completely fascinated by the greenhouse in the attic, which you can access through the marvellous staircase. And by all the intricate details of the house. Upon your entrance at Maison Horta, they will give you a pamphlet with a map at the back – suggesting an art nouveau walk around the neighbourhood to marvel at art nouveau facades of emblematic buildings. Embark on your walk! 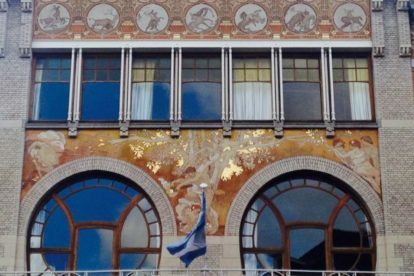 Alternatively, this excellent article details an itinerary, or there are many free art nouveau walking tours available. Once your walk is completed and you are nostalgic of the days where glamour and gold were in architectural fashion, hit Parlor Coffee or Forcado (check out the articles) to top off a perfect Brussels’ afternoon.